This entry was posted on March 24, 2015 by Jessica Anderson. Fore! The golf season is just around the corner! Planning a golf tournament? Are you tired of the same old golf trophies at your event? Looking for something new and different, yet has a 'wow' factor that will keep your players coming back each year? Then check out our new premium golf tournament awards! Our beautiful new Profile Cup. Notice the golf ball inspired base! Made by Crystal Blanc, these new awards will delight your golf champions. We want our golf tournament customers have the most beautiful and impressive golf awards possible for their next competition, delivered in time for their event. 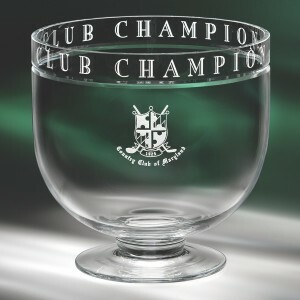 Golf Cups: The quintessential golf award, our premium glass golf cups will be cherished for years to come. We offer 5 new designs of chalice style golf cup awards including the Laurel Cup, the Narrative Golf Cup, the Profile Golf Cup, McKinley Cup, and the Rainier Golf Cup. Add prestige at your event by awarding one of these beautiful cups to your tournament champion! Golf Vases: We are offering two new etched golf vases, the Expressions Golf Vase and the Vinata Vase. 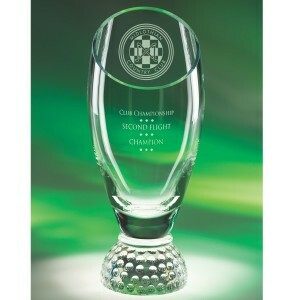 Made of hand blown glass, tournament winners will be proud to display these sophisticated awards in their home or office. Other Personalized Golf Gifts: Other new cherished golf gifts are the Spirits Golf Decanter , Biscuit Barrel and the Crystal Museum Bowl. These glass gifts include personalized etching in the price of the awards. Another etched golf gift for someone special. I love the engraving around the edge of the bowl. Funny Awards: If your tournament is more low-key and relaxed, you check out our line of funny golf trophies. Ok, so they aren't technically "new" awards, but they are budget friendly, extremly popular, and customer favorites. Definitely not as classy as the new premium awards discussed above, however they are sure to generate lots of laughs on the course! Engraving Ideas: Looking for ideas of how to present your awards at your next tournament? Read my past blog Golf Tournament Trophies for tips on presenting your golf awards and for engraving ideas. In addition to these new awards, we offer hundreds of golf options in every price range in our online Golf Catalog. Browse all of our golf awards now to find the prefect awards for your next golf tournament! Happy Spring!